If you’re familiar with ultrasonic humidifiers or have used them in the past, there’s a good chance you’ve seen or heard about white dust. Is it something to be concerned about? White dust is the natural byproduct of minerals found naturally in water. Ultrasonic humidifiers can occasionally release this mineral residue during the humidification process. You may see it on surfaces around your humidifier, or even within the bae of the unit while you’re cleaning it. 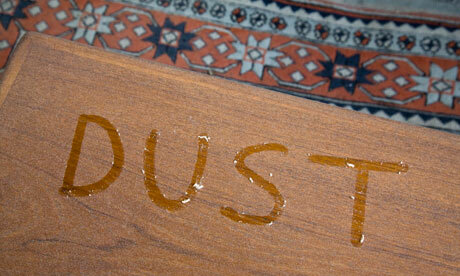 White dust is completely harmless, and easily cleaned or wiped away – just as you would normal dust. The amount of white dust, or if you see it at all, depends on the type of water used in your humidifier as well its mineral count. Use distilled water. Distilled water has a very low mineral count, which means it won’t product white dust. As an added bonus, distilled water can also reduce the frequency with which you have to clean your humidifier. It can also prolong filter life, if your humidifier has one. Use a demineralization cartridge. Luma Comfort humidifiers both come with demineralization cartridges that are designed specifically to trap minerals before they can be released into the air. This would eliminate, or at least greatly reduce the presence of white dust. On both Luma Comfort humidifier models, the deminernalization cartridge can be found attached to the water tank cover. Even if you don’t see white dust, you should still be sure to clean your humidifier regularly to prevent the growth of mold, mildew and bacteria. Even if your humidifier is coated with anti-bacterial plastic (like the Luma Comfort units), it still needs regular cleaning. This will also prolong the lifespan of your unit. This entry was posted in Humidifiers by Luma Comfort Team. Bookmark the permalink. Could you please provide informatioin how long a demineralization cartridge lasts and where to buy a replacement. Niether of this is mentioned in the manual nor are any offered by online dealers. BTW: can the cartridge be cleaned (vinegar) to restore its effectiveness? Our demineralization cartridges are designed to work for upwards of 1 year before needing a replacement. Depending on the hardness of your water, we also recommend soaking the cartridge in a solution of water with a cap full of vinegar once a month to recharge it. Replacement demineralization cartridges will soon be available at all retailers where our humidifiers are sold. For a list of our current online retail partners, please see our Web site here: http://www.lumacomfort.com/where-to-buy/. We hope this helps! Please let us know if you have any other questions at all.